Squidoo.com made waves on the web a few years ago. It was a revolutionary (for it’s time) user-content driven site that marketers flocked too to funnel free traffic to their site or promote affiliate offers right from the pages (lenses). It was the second favorite choice for Bum Marketers behind Ezine Articles because Google loved Squidoo. It was relatively easy to get #1 page rankings for lenses built on long tail keywords. But like all good things, they have to end. Squidoo was probably too good. People found out about the awesome-ness of Squidoo and started to abuse it. It was only a matter of time until they cracked down on the spam lenses and abusers of the technology. Many copy-cat sites were built and soon people forgot about Squidoo. But I’m happy to say Squidoo is back! 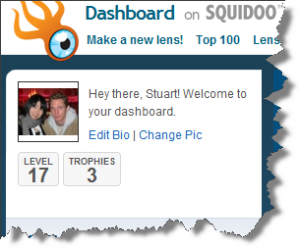 In the glory days of Squidoo I set up a lens where I was giving away a free “how to make money on squidoo” ebook. That lens is still functional today and I get anywhere from 10 – 30 new subscribers a day from it. I got an email the other day from a subscriber who download that report and loved my emails. She included a link to her first lens. I replied back and told her it looked really good and asked her if she has made any sales from it yet? She replied and told me she had already made 11 sales of amazon products which has earned her $15 in profits – and it was her very first lens that she created just 2 weeks prior! Sure, $15 is not enough to buy a yacht and take a year off to sail around the world, but if she scales it up, creates 10 lenses following the same pattern as her first one, she’ll be looking at some very nice passive monthly income. I love success stories like this. It lets me know that my hard work in teaching others about online marketing is paying off. And let’s me know that Squidoo is not dead – it’s very much alive. Squidoo never died, they just took a step out of the spotlight to makes themselves better – and now they’re back in full force. I recommend you check out Squidoo today! It’s totally free to join and start making lenses about anything you want. They are still a great place to share your expertise to help promote your business – and better than before. Use it for what it was made for and it will be good to you. p.s. What do you like/dislike about Squidoo? Leave your comment below and share on facebook and twitter! Reading “Squidoo is not dead” has enewed my interest to begin learning more about squidoo opportunities in listbuilding and sales. I have been a squidoo subscriber for three years but have never really got down to really using it. Can you suggest some reading materials on how best to create efective and productive lenses? Glad I subscribe to your site.